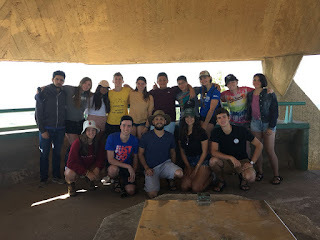 On Sunday, February 19, 2018, We went on a "טיול" trip to Tel Gezer. Tel Gezer is known for being right in the middle of Israel and for its layered Archaeology. Many civilizations settled here. Over time this land would be conquered many times, leading civilizations to be stacked upon each other as groups moved in and out. tools to keep the water supply at a safe height. Next there was a case mate wall. A case mate wall is a structure consisting of two layers that were very dense. Each layer consisted of multiple stones and were packed tight. Inside of these case mate walls were housing and markets. During times of warfare these walls would be filled with sand as a trap and defense. The idea that the people of this time knew that there were was to build such massive structures with such detailed purposes is amazing. The Canaanite people were obviously advanced and most likely succeed in the way the lived and survived. There are two possible reasons for why Avraham did not visit Gezer. Avraham, being the father of monotheism, only beloved in one g-d. At what is believed to be the temple at Gezer, are multiple stones. These stones spaced apart and upright, seem to be a place that held shrines for multiple g-ds. Avraham, while embarking on his journeys may not have stopped at Gezer for this reason. The idea that people were praying to multiple g-ds was not an idea Avraham was going to be able to accept as he is imaged so close to G-d in the Torah. Another reason why Avraham may not have visited Gezer was for the there was of sacrifice. The people that inhabited Gezer were rumored to have practiced child sacrifice at some point in time. This idea of child sacrifice was most likely an uncomfortable topic for Avraham. This, however is quite ironic as Avraham is told by G-d in the Torah, to sacrifice is favorite son Yitzhak. Wether it was one or both of these reasons, Avraham never did visit Gezer. There are some very interesting archaeological finds from the grounds of Gezer. First off there was a very interesting plaque with writing on it. This type of find known as as ostracon. An ostracon is an archeological find with writing or symbols engraved on it. A specific ostracon that was found at Gezer is believed to be a farming calendar. The symbols on the ostracon can be translated and identified due to the evolution of letters and characters. It is also believed that parts of this calendar may have been written by a child. This idea that a child wrote parts of the un-identifyable calendar is not far fetched. A huge core value of Judaism is education. This idea stems from Jews being "obligated" to study Torah. Teaching the young to write is a way to keep the tradition alive. Another archaeological find at Gezer was a set of gates. These gates were built during the era of King Solomon. These anachronistic gates were found out of place. Anachronistic, means the artifact or find was out of place or mixed in with finds from a different time period. These finds are two unique and significant archaeological finds from Gezer. I will leave you all with this question: If Avraham had stopped at Gezer during his travels, what would he have thought? Would this encounter changed the way Avraham saw monotheism? Would Avraham have established any new rituals to be practiced in Judaism for the next generations? I feel like stopping at Tel Gezer would have only affected Avraham's belief in monotheism in the way of strengthening it. I don't think he would have ditched his beliefs, but he might have picked up some cultural traditions. That's just kind of what happens when you stay somewhere for a while. Maybe he'd pass on some of the food practices or expressions used by the people of Tel Gezer. Perhaps, seeing child sacrifice and/or monotheism being practiced would cause him to reinforce the opposite in his own people. I think that Avraham would have been appalled at the polytheism and child sacrifice practiced at Tel Gezer. As shown in the Torah, Avraham respected the monotheism of one God. He believed that that one God should receive all the sacrifices, not many Gods. As for child sacrifice specifically I don't know how Avraham would have reacted as he did voluntarily give his own son up for sacrifice to God. I would be curious to talk to Avraham and learn about his morals. If Avraham had stopped at Gezer during his travels he would have thought of it as an advanced civilization that has some minior flaws. Avraham practiced monotheism, the belief in one God. I do not belive that an encounter at Tel Gezer would have changed Avraham's belief because he was very passinate, thus he would have stuck behind his beliefs no matter what. As far as adopting new rituals, Avraham might pass on some of the culture of food or technilogical adavancents. Also, after a visit to Tel Gezer he would further reinforce the practice of monotheism. If Avraham would have stopped at Tel Gezer, I do not believe that he would be in agreement with the people and their practices. As stated, he was the only named founder of monotheism, therefore it should be to him that the people and their polytheistic beliefs are wrong to him. If anything, an encounter such as this should have strengthened Avraham's monotheistic beliefs. Here, he would find their temple with the pillars that represent many polytheistic deities of the people of Tel Gezer. This is an absolute contradiction to his beliefs and his God. While he did almost sacrifice his own child, he most likely would disagree with the possible child sacrifice practiced by these people, because it was not commanded by the god he believed in. Finally, I do not believe any new rituals would have been created after this experience, and even if new practices came from this experience, it is highly unlikely that any of them would survive and be around with regular practice. This is so because as with many other practices, they would no longer have relevance after the destruction of the second Temple. I believe that Avraham would have looked down on the people of Tel Gezer for their practices of polytheism and child sacrifice. Despite their technology being ahead of the time and having a slightly more advanced civilization, certain aforementioned practices were still barbaric. Avraham wouldn’t have changed his beliefs, but perhaps would’ve tried to change those of the people living at Tel Gezer. The only things Avraham would’ve considered adapting would’ve been the technologies, and even then it wouldn’t have been to the Jewish religion, but for the Jewish people. If Avraham would have stopped at Tel Gezer then we have no way of knowing what would have happened. He could have stayed with them and started to just follow their life style and Judaism might not have even happened. He could have stayed for a little and picked up some techniques on how to start a civilization and maybe he would have been able to set up one in Israel and we would have never had to go to Egypt in the first place. All we can know is that some major things would have changed if he stayed for any longer than a few days but it is impossible to say what exactly would have happened. Well let's not forget the significance of the ostracon containing information about farming. It gave specific information about dates and harvest times, which implies that it was used by the farmers themselves. THE FARMERS WERE LITERATE! Usually lower class people of the time were illiterate. The fact that these farmers could write and read (from apparently an early age) is a demonstration of our value of education. If Avraham had stopped at Tel Gezer, his religious views would not have changed. This is because he was a strong believer in monotheism and would not have switched his views on it just by seeing a group of people who believed in polytheism. Avraham would not have followed the practice of child sacrifice either. Some would argue that he would follow in this practice because he was willing to sacrifice his son. I would disagree with that idea because Avraham was most likely asked to sacrifice his favorite son to show how much he was willing to give up for God. By being willing to sacrifice his son, Avraham showed his testament to God, not his comfort with the practice of child sacrifice. If Avraham stopped at Tel Gezer he would have admired how advanced their civilization was. I think he would have admired their technology and architecture. Seeing Tel Gezer would have affected Avraham's monotheistic perspective on religion. I think that the practice of child sacrifice would begin to be practiced in Judaism as well. Avrahams set views would not have changed, but merely affected. The technological and architectural advances the city of Tel Gezer had to offer would've intriqued Avraham, but in the end his religious views would've remained the same. even though Avraham was willing to sacrafice his son, he was doing it by gods command. His support for believing in one god was so deep that he was willing to do anything to give himself to god. Even if that meant child sacrifice. Since he has learned his lesson on child sacrifice, I would not expect Avraham to even think about adapting child sacrafice as part of his religion. The technology world-wide would have advanced sooner if Avraham had visited Tel Gezer. I believe he would've been inspired to pass down innovative ideas from generation to generation. I'm not sure if Avraham's views on monotheism would've necessarily changed too drastically, but I do believe he would've been personally effected by the practices and beliefs of the people in Tel Gezer. I doubt that he would've merely gone along with the practices and lifestyles of the surrounding people, due to the fact that he was already a religious man, and assumed founder of monotheism. If something were to be changed for Avraham, it would be an increase in his monotheistic ways, because of how appalled he would be towards the people of Tel Gezer. On the point of child sacrifice, he saw his ordeal as being the word of God, while the people of Tel Gezer, well, not quite the same story. If Avraham had stopped at Tel Gezer he might have just been impressed by an advanced society or he could have been discussed by some of their religious practices. We know from archeological evidence that they were a polytheistic people and that they might have done human sacrifices which is a big no no in judaism. I think that if Abraham had stopped at Tel Gezer, rather than settled in an unsettled location in canaan, Jewish rituals may revolve more around a polytheistic belief system. This would be because of the local population and the locals' rituals impacting his beliefs. I believe if Avraham stoped at Tel Gezer he would of thought that it was immoral to practice polytheism. He obviously believed it was wrong if he smashed the idols in his father’s shop so, therefore, he would not have been pleased with their practice. Obviously, from smashing the idols and starting over, Avraham’s believes were solid. Even if he did stop, I don’t believe he would’ve changed his believes because stopping in a polytheistic civilization would not have changed his perspective because he just left one. I believe that if Avraham had stopped at Tel Gezer, it would have been a sign for the jewish rituals to focus more on the polytheistic belief system. He had many beliefs that were important such as that deep belief in one good, which he was willing to do anything for that god. I feel like if he stopped there, it would change on the population of Gezer and the local's way of doing their rituals because of his beliefs. I think if Avraham had stopped at Tel Gezer it would have affected his belief in monotheism but it wouldn't have made him ditch all his other beliefs. Avraham would have learned and picked up more cultural traditions. He'd come across some of the people of Tel Gezer and witness them doing some food practises or showing particular expressions. Welcome to the Kitat Keshet Blog!